We’d love your help. Let us know what’s wrong with this preview of The Colors of History by Clive Gifford. To ask other readers questions about The Colors of History, please sign up. This is definitely a different, but very interesting, view of history. I loved the illustrations, and I learned a few things. I look forward to sharing this with my library patrons. Thank you to QEB Publishing via Netgalley for a copy of the book in exchange for my honest review. Throughout human history, colors have played a much more significant role than what we give them credit for! All colors have a story to tell, and The Colors of History tell exactly those stories. Did you know that there are different shades of yellow, all with their own names and history? What color comes from cactus creatures? What is Puce? What a wonderful book to have! The Colors of History is a very interesting, and very well constructed book! Filled with fun facts and history, it never gets Throughout human history, colors have played a much more significant role than what we give them credit for! All colors have a story to tell, and The Colors of History tell exactly those stories. Did you know that there are different shades of yellow, all with their own names and history? What color comes from cactus creatures? What is Puce? What a wonderful book to have! The Colors of History is a very interesting, and very well constructed book! Filled with fun facts and history, it never gets dull, leaving the reader with at least one or two intriguing facts to remember for every color! The illustrations are also unique and absolutely stunning. The facts are extremely fascinating. I loved learning about the different colors. So why 2 stars? Glad you asked. 1) Most of these colors aren't typical colors, a pronunciation guide would have been nice, especially since this is written for younger readers. 2) Zero back matter. Where did these facts come from? For all we know, all of these fun facts were made up. 3) Awful design. Black text on dark colors or speckled colors. It was such an eye strain. I recently read Kassia St Klair’s ‘The Secret Lives Of Colour’ and I found it fascinating and I really enjoyed that book but it’s nice to read a stunning but concise version of the same kind of thing, perfect for young readers. I love how it’s divided into sections of various shades of colours and how the information was broken down in the book. With interesting facts about different colours, delivered with incredible illustrations that really shine a light on the colours that were being profiled I recently read Kassia St Klair’s ‘The Secret Lives Of Colour’ and I found it fascinating and I really enjoyed that book but it’s nice to read a stunning but concise version of the same kind of thing, perfect for young readers. I love how it’s divided into sections of various shades of colours and how the information was broken down in the book. With interesting facts about different colours, delivered with incredible illustrations that really shine a light on the colours that were being profiled throughout. The artwork is gorgeous, the lime and lead white page is really beautiful, the Scheele’s Green page is really one of my favourite pages and the Egyptian Blue page is really hard to forget - it would be difficult to pick one definitive spread throughout this book as these colours really are brought to life. A gorgeous and informative book from start to finish. I received this in exchange for an honest review. With thanks to Netgalley. I really enjoyed The Colours of History, it’s packed with information and beautifully designed. The colours and artworks are stunning and so child-friendly. I would love to own this as a coffee table book! It’s brilliant to read together and if I had children, I would definitely want the I received this in exchange for an honest review. With thanks to Netgalley. I really enjoyed The Colours of History, it’s packed with information and beautifully designed. The colours and artworks are stunning and so child-friendly. I would love to own this as a coffee table book! It’s brilliant to read together and if I had children, I would definitely want them to own a copy of this. I looooove any art/art history books about color, and this one is a fabulous 64-page book for kids. Simplified and interesting! I recommend Victoria Finlay’s books about color for delving deeper into the history of each one. Interesting factoid nonfiction book about the history and science between famous colors. While the cartoony art was engaging, I would have liked to see photographs (especially of some of the famous artwork) as well. Really enjoyed the way historical information was laid out in this non fiction title about colors. 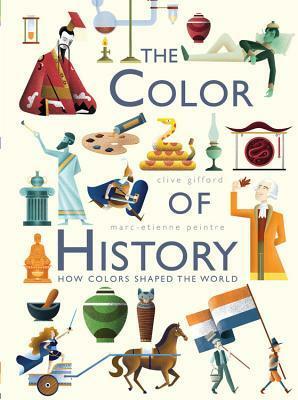 The Colors of History is a children's non fiction book written by Clive Gifford and illustrated by Marc-Etienne Peintre. Color has played an important part in history, in unexpected ways that most of us never realize. Why did Roman emperors wear purple? Which color is made from crushed beetles? What green pigment might be used to build super-fast computers of the future? Find out the answers to these and many more questions in this vibrant exploration of the stories behind different colors, and The Colors of History is a children's non fiction book written by Clive Gifford and illustrated by Marc-Etienne Peintre. Color has played an important part in history, in unexpected ways that most of us never realize. Why did Roman emperors wear purple? Which color is made from crushed beetles? What green pigment might be used to build super-fast computers of the future? Find out the answers to these and many more questions in this vibrant exploration of the stories behind different colors, and the roles they've played throughout history. From black to white, and all the colors in between, every shade has a story to tell. Each color group is introduced with a stunning and interpretive double-page spread illustration, followed by illustrated entries exploring the ‘colorful’ history of particular shades. With vivid, thought-provoking illustrations and engaging bite-sized text, this book is a feast for the eyes and the mind, ready to enthrall budding artists and historians alike. This is a fascinating book that looks at a sample of colour shades and explains what it was named after or how it was named and some of its uses. As an adult I’m finding this interesting! With simple text and stunning support illustrations this is one of those books to have in your general or art classroom. My students would have gotten such a buzz from learning about the history of blues, reds, and greens. An absolutely beautiful book! Divided by color, each section tells the story of unique colors in history. From Saffron Yellow and Tyrian Purple to Mummy Brown and Egyptian Blue, colors have played some important roles in human history, and many of their stories are unknown. The graphics are clear and simple, the colors pop and the information is straight forward and easy to understand. I think kids and adults alike will find something of interest in this book! This is a fascinating look at how various parts of our history and intrinsically linked to certain colours and how those colours came to prominence. It is interesting for kids and adults alike and will add colour to your current knowledge of certain historical periods.